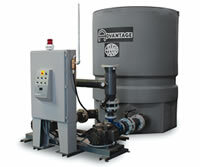 Advantage manufactures a complete line of pump tank systems for industrial applications. Pump tanks are available in standard capacities from 275 to 3200 gallons. Reservoirs are constructed from rotationally molded polyethylene, epoxy coated mild steel or stainless steel. Mild steel and stainless steel tanks are banded for added strength. Pumps from 1.5 HP to 60 HP are routinely mounted on the systems. Single and 2-pump systems are available. 2-Pump systems are preferred for serveral reasons. Information on 2-Pump systems is discussed below. 2-pump tank systems include a divided reservoir with center baffle that splits the tank into a hot well and a cold well. Water from the cold well is pumped to the use points in a facility by the process pump where heat is picked up. The process water is returned to the hot well of the tank generally 5°-10° F warmer. Water from the hot well is pumped to the cooling device (chiller or cooling tower) where the water is cooled to its set point and • Thermal storage is achieved with a 2-pump system. Every 200 gallons of water stored provides about a 3 ton reserve at a 20°F rise. Thermal storage provides superior temperature control as system load spikes are absorbed with little affect on process water temperature. The 2-pump system provides optimum efficiency even when the process flow varies. Cooling towers and chillers work their best when their design flow rate is maintained. In the industrial environment, process flow is rarely constant. Valves on hydraulic systems are opening and closing, machines are coming on and off line, and molds requiring different flow rates are constantly being changed. The recirculating pump on a 2-pump system assures constant flow to the cooling tower or chiller under changing process flow conditions. Insufficient flow to a cooling tower can cause poor water coverage over the PVC fill leading to over-evaporation and scaling. Too much water can cause excess water loss and improper cooling. Insufficient flow to a chiller can cause nuisance flow switch tripping, water over-cooling and evaporator freezing. Too much flow can cause erosion damage to the evaporator vessel. For more information about Split Reservoir pumping systems call the Advantage Sales Department at 317-887-0729. Would you like to Download FYI #258 to your browser?